We’d love your help. Let us know what’s wrong with this preview of Making Trousers for Men & Women by David Page Coffin. Comfortable, flattering pants can be challenging to make - but they're wonderful to wear. In this book, David Coffin provides his inventive, sure-fire methods for getting it right. With his characteristic precision and straight talk - and with the help of photographs, drawings, and exclusive access to a series of online video sequences - Coffin teaches the reader how to get Comfortable, flattering pants can be challenging to make - but they're wonderful to wear. In this book, David Coffin provides his inventive, sure-fire methods for getting it right. With his characteristic precision and straight talk - and with the help of photographs, drawings, and exclusive access to a series of online video sequences - Coffin teaches the reader how to get great results, whether making a showcase garment or just whipping out an everyday pair. To ask other readers questions about Making Trousers for Men & Women, please sign up. 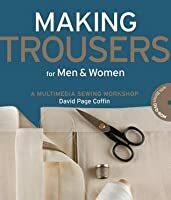 I wondered if this book shows or teaches you anything about lining trousers? Such as a half or full leg lining? Interesting to know the thinking that can go into making a pair of pants, and pros and cons of various features. However, it doesn't give enough help on making the pants, or the pattern, FIT. I still need to search elsewhere.